To run any server software behind a NAT is a headache, but don't worry because we'll teach You how to do it. There are hundred kinds of NAT devices out there in the market and we can not guide You through each of them, but the "concept" is the same, so If you see our guide and understand the meaning of each step, You will be able to setup Your router properly. TOPIC !! What ports are used by a web server? A web server uses port 80 for HTTP and port 443 for HTTPS, it only uses TCP but not UDP, so all You need to do is to map any connection to your NAT at port 80/443 to Your local PC inside the NAT at port 80/443. 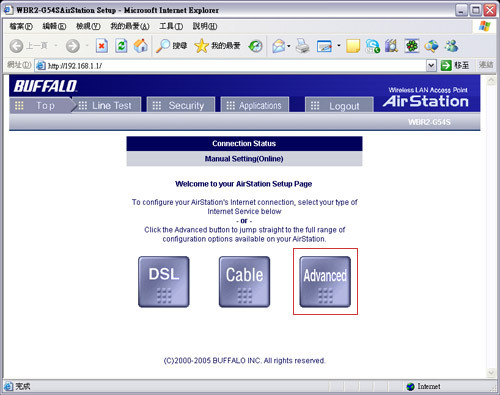 The first step to connect to Your NAT is to connect to its web administration interface, usually a NAT comes with a web based admin interface, and of course You need to read the manual for how to connect to it. 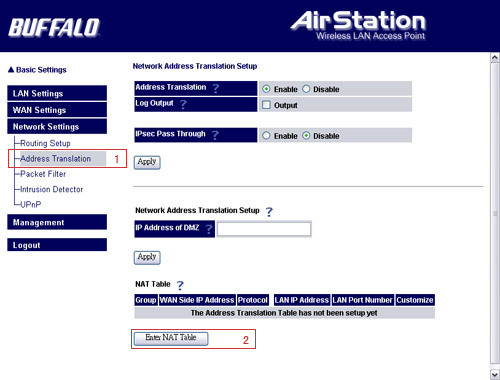 Most of the NAT requires You to enter the username and the password, please refer to its manual for the default one. 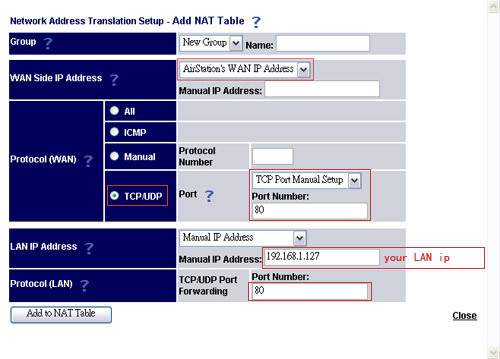 After You login the NAT, look for the Address translation or the Port mapping sections, and try to add a new rule for all incoming connections made to the NAT's public address at port 80, forward them to Your local PC's IP address at the same port 80. 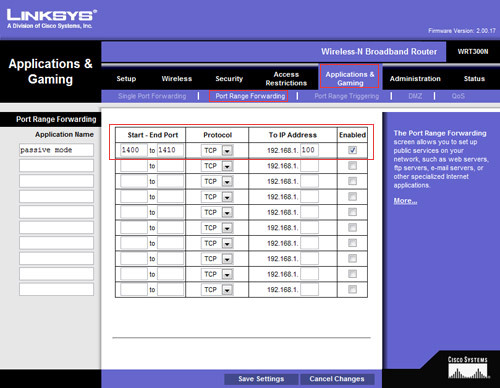 Simply do the same for the port 443 and remember that only apply this to TCP protocol. Connect to Your NAT's web interface, and login. 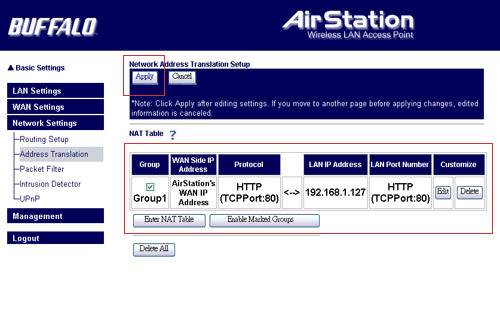 Click advanced and look for address translation setting. Click ENTER NAT TABLE, and input the first rule for port 80, remember to lookup Your local PC's LAN ip-address by the command, ipconfig.exe under windows command line prompt. Click ADD TO NAT TABLE, You will see this new rule, don't forget to apply and restart Your NAT. And if you are setting up RaidenFTPD ftp server, add the rules like above but for your server port, implicit ssl port and explicit ssl port. The rules for web server is done, but if you are setting up a RaidenFTPD you need to setup data ports forwarding too. Add a rule for your RaidenFTPD data ports, from the start to end of the range, using tcp protocol and forward to your LAN IP-Address.